Join me Sunday morning November 22 at 11 am EST for one hour discussion of sustainability where I’ll introduce 216 Cheaper than Free resources available to use for innovations of all kinds. Blab is a new live streaming video platform that makes it easy for people to hold meaningful discussions. 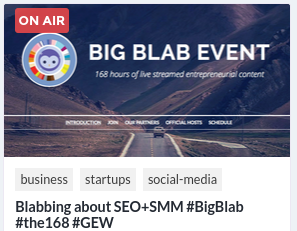 The 168 Hour Big Blab Event has already had 738 participant talking about a huge variety of issues relevant to entrepreneurs.